For women, this work is best known for the correction of the prolapsed, fallen, or tilted uterus and bladder. This condition will sometimes express as various symptoms including painful ovulation and menses, irregular menstrual patterns, infertility, ovarian cysts and polyps, endometriosis and uterine fibroids. The spirit of the womb remains even when there is a hysterectomy. Adhesions from invasive treatments to the pelvic and abdominal area, including scars from hysterectomies and Cesarean sections, are diminished gradually and safely when addressed by uterine massage. Those women who have had hysterectomies report that after receiving this type of massage they feel an increased flow of blood, old aches and pains in the hips, legs and groin diminish, varicosities improve, constipation is relieved, and lymph flow from the legs and feet is greatly enhanced giving an overall sense of subtle awareness of their own hemodynamics previously not felt. Women are able to come to terms with the sense of grief and loss as a result of their surgeries, because the massage techniques flush out repressed emotions as well. Don Elijio taught that a woman's uterus is her physical, spiritual and emotional center. If it is out of balance, then her life is out of balance. Dr. Arvigo says the uterus is a woman's "second brain" and comprises the spiritual center of her being. A healthy positioning of the uterus is behind and slightly leaning over the bladder in the center of the pelvis, about one and a half inches above the pubic bone. The uterus is held in this position by smooth muscle, the vaginal wall and ligaments that attach it to the back, front, and sides of the pelvis. These uterine ligaments are designed to stretch in order to accommodate an enlarged uterus during menses, a growing fetus, and to move freely when the bladder or bowel is full. These ligaments and muscles can weaken or become over stretched due to a sudden impact such as a fall, a motor vehicle accident, pregnancy and labor, poor postural alignment, improper nutrition, surgeries or a host of other reasons. When the supporting ligaments and muscles loosen or become over stretched, the uterus can tip or fall downward, forward, backward or to either side. 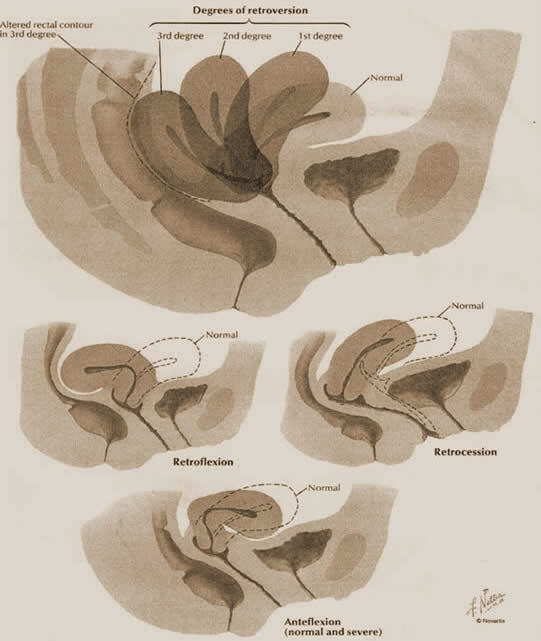 These are called prolapses, anteflexions and retroversions of the uterus. In fact, this can happen to any of the hollow organs in the abdominal which are all supported by ligaments and other connective tissues. Generally, modern western medicine has little to offer women with this problem except for surgery. There is a host of physical and emotional symptoms that can be addressed and prevented with these simple, non-invasive massage techniques. When reproductive organs shift, they constrict the normal flow of blood and lymph, disrupt nerve connections and the normal communications of hormones throughout the body. Just a few extra ounces of pressure (such as right before menstruation) sitting on blood and lymph vessels can cause havoc throughout different systems in the body. By shifting the uterus back into place, the natural balance of the body is restored in the pelvic region and surrounding organs. Toxins are flushed away and nutrients that help to tone tissue and balance hormones are restored. This is essential for a healthy menstrual cycle, pregnancy, labor, and delivery. This work also softens old adhesions from traumatic pelvic and abdominal conditions, including surgery, chronic inflammation, hysterectomies, uterine fibroids, endometriosis, and cesarean delivery. In addition, digestive and urinary and system problems can also be helped with ATMAY. ATMAY is always done externally through the belly wall with gentle but firm lifting and gliding strokes. Other aspects of this work address the upper abdomen, spine and hip complex to further enhance blood and lymph circulation and nerve root adhesions due to muscular holding patterns and poor posture. WARNING: If you are using an IUD or have pelvic inflammation this technique is contraindicated.